Several of you have asked how I produce my audio and sound for video and wanted to know the exact settings and gear that I use. In this episode, I run through my workflow for capturing dialogue. This is not meant as a recipe, but as a starting point–sort of a practical example that will hopefully answer some of the nitty gritty real-life questions that usually are not covered in audio training. Please leave any questions in the comments so we can answer those as well! All music by and copyrighted by Curtis Judd. Hi curtis, I purchased a Rode Ntg2 and i need a good preamp do the tascam Dr 40 work well? Or i need obligatory a Tascam Dr100mkii? Thanks! Great advice and great production values. I hope to emulate the quality seen here. That music! Spot on. I am constantly amazed by how useful and helpful your channel is, and how well you present the information. I’m not talking just production quality, but you have a teaching style that is very effective, approachable and engaging. Unlike many other channels, I never feel bored (even when you’re covering topics that are still over my head), I never feel patronized and I never feel that your primary motivation is coaxing us towards paid content. That said, I’m devouring your free content as fast as I can absorb it, and I am sure it is only a matter of time before I will gladly be purchasing any advanced or in-depth paid content you offer. Thanks so much for making all of this a little bit easier! Curtis, The BEST way to trim your clip of excess video/audio, is when they are merged, double click the merged clip, it will come up in the source monitor, scrub the footage to the point where you want the clip to start ie. after your clap, and set that as your ‘In Point’, scrub to the end of your clip where you want it to end, select your ‘Out Point. Then drag the video down to your timeline. I see you are using the DR100. I need separate audio recording for my DSLR. I currently use an SD552, but and big but, it’s heavy and just not suitable for fast moving situations. It does sound great though. I was thinking about the MixPre3, but even though the sound will be close to the 552, it need outboard power. So what about the DR100 mkIII? I’m sure the sound will not be as good as the MixPre or my 552, but since all we do is dialogue and we use AT shotgun or hypercardiod mics, I’m thinking it may be good enough. So my top wants are clean preamps, XLR in and mic level out for GH5. Hello! Thanks for video! I need to record audio for a shortmovie, I will take all the video in mountain, so without electricity! I want to have a good audio, I have got a Rode NTG2 mic (and the boompole) but I need a recorder. I read that you suggested the Tascam DR-60DmkII. If I put the NTG2 into the DR-60DmkII, will I have a good audio, or anyway I need a preamp to have a good audio? I am just a novice and I find this video very useful. Very nice video and good advice! I’ll add one small thing regarding the workflow. I really like using Automator for file naming BEFORE importing into a session. It’s a fairly quick step and can potentially save a lot of time when you’re dealing with numerous files and needing to separate scenes/types etc. Again, thanks nice work! It is great, thank you. When recording dialogue: I’m going to record multiple (5) people, who are sitting around a table, in a circle-kind of position. Would it be worth the trouble of using 4 Lavmics, hooked up to 2 audio recorders ( h1Zoom) via a "Rode SC6 Iphone accessory? That way I would only get 2 tracks to work with, for 4 different voices. I haven’t worked with 2 Lavmics hooked up t 1 audio-recorder before, so I’m not sure how that 1 track would sound with 2 people talking. Is the other persons voice cancelled out if the other one is speaking? In the end, should I just go with a boom-mic, or shutgun mic? The work you do for us, the viewer, around both lights and audio is very valuable. My query is can Audacity cover most audio editing issues you use with creative cloud? Can anyone point me to a video explaining live music audio for video. ? When you record audio in this fashion (with a field recorder in mono or stereo), can you later manipulate the audio on your computer to 5.1 surround on the final video? My current camera records in 5.1 and does a pretty good job of it. Curtis, thanks very much for this and other helpful videos! I recorded my kids’ orchestral recital, and then my daughter took the cheap underwater camera to do her project to produce a trailer. I didn’t pay much attention to audio until these 2 occasions when both audio were practically unusable. I’ve always been doing still photography. Your videos explained so much, and actually saved me a bunch of money. I thought to get round the audio problem, I would have to get a $300+ used wireless lavalier mic system. I wasn’t thinking digital editing these days. Getting a high quality dedicated audio recorder like the Tascam DR-44WL where I can now decouple the audio and sync later in post yields way better result! From this video, it seems syncing the audio and video is even easier than I thought with Premier! Oh no, that was just for the screencast part of the video. In that case it is just easier to use the audio interface so that the screen and audio are recorded together. When I shoot other talent, I pretty much always use the Tascam or Zoom. I use Edius Pro 9 and Zoom H4N Pro. Pl let me know how to sync audio. Also please note that I am an ardent follower of all your videos. You are simply superb. Hi Mohammad, The DR-40 will work. While I have not used it personally, I have heard that its pre-amps are not quite as noise-free as the DR-100 mk II. But it will certainly work! Curtis what about using this mic plugged to a Ntg2 for interviews (outdoor and indoor), what settings you suggest?Gain at H or M ? I am planning to buy an audio recorder, should i go for zoom h2n? or you would recommend me any other thing in this price range. I love making videos, but now I am planning to work(learn) a bit with audio. Thank you Curtis Judd for this video. Learnt a lot from all your videos. by the way i’ve recorded sound for a corporate video, where i used shure sm59 cardiod mic with a zoom h6 recorder. Boomed it above the artist head, i hear a gud amount of noise in my recording. Is there any way to reduce the noise in my recording? olá Curtis ! mi english no good ! I`m brazilian and i like to work edit dialogue for video. You make the NTG 2 sound so good. I have the H4n and find the preamps less than desired. 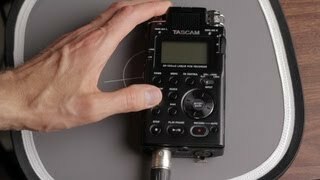 Would you recommend the Tascam DR-100 mkII over the Zoom? This is perfect Curtis for the beginner! Thank you for steering me to this! What if I put the mic on the right hand side of the actor & I direct it to his face. But the mic stand is lower than actor height. Hi Curtis, I’m from Brazil and I’m learning a lot from your channel, thanks a lot! I have a question that I could not find an answer on your videos: how can I record 2 lavaliers? What would be the workflow for that? Actually I have a Zoom H4n, but now I need to record some interviews between 2 persons, each one with lav mics. How can I do that on a budget? In Brazil all shotgun and good mics are 3 or 4 times more expensive than Amazon prices, for exemple. Can I use 2 Giant Squid lav mics on Zoom H4n with some kind of 35mm to XLR to connect the lavs to XLR inputs on H4n? If I use just 1 lav mic I can plug the mic on the external 35mm stereo mic input at the back of H4n, but my situation now is the need to use 2 lav mics, and I do not know how to do the trick. Please, can you give some advice about that? Thanks in advance! It reminds me of many conversations I had before. My brother is a famous musician and he constantly talks about all types of music that make me feel like I’m about to vomit. His opinion is that it doesn’t matter because I’m the problem and I’m the one who doesn’t understand… maybe but it still makes me sick listening to it. Similarly, I used to work at a kitchen while studying in the university and I remember the "chef" explaining about combinations of things and in the end of the day he made this dish that no one liked… don’t know if it mattered to anyone that the "combination" was "correct" it still tasted like dry dirt. My point is… it’s all perspective and personal taste. I learned a lot from this video and other video you made. They are saved to my favourties because they are good and informative but honestly I can’t bloody stand the sound of this video. I hate shotgun microphones, I seriously dislike most dynamic microphones in general and the lower edges and extra mid range + extra base is so unnatural and unappealing and your voice doesn’t look or sound realistic. It’s like watching a 3D films with 2D creatures. I see you speak and the sound doesn’t make any sense it’s like you pasted it with glue. There is too much base tones, it’s not that rich it’s just very conspicuous and unnaturally bold. Sorry but compare that to the sound you get from a Blue Spark or (of course) a Neumann and the sound from a shotgun looks pretty childish in my opinion. But I do appreciate the work flow, the video, the fact you’re using Tascam and everything. We just don’t agree at all about the quality and appeal of the sound. Of course, I understand that it’s all a question if need. When we make short videos for documentary purposes (my work place) we often use dynamic mics and shotguns because they are often and for practical reasons, easier to handle but it is certainly not the sound I like and inside studios it will never be my choice! Can you use this in a livestream using the phantom power? Hi. Are you using the $19.99/month single ap version of Premiere Pro? Thanks. I’m involved with audiobook production, a lot of the narrators use mics like the tlm103 or 102 the mkh-416 shotgun, the cad e100s, recording an audiobook demands a fairly pristine background and pickup of detailed shades of audio in voice expression and inflection etc, do you think one of those interior dialog mics could fit the bill for this use? Fantastic help to establish a beginning point. Useful too, that I am now familiarized with Audition’s multiple clickables. Thanks! I just got a zoom h4n and a rode ntg 2. I need some help because when I record it records only on the left channel and am just a bit confused on what i should do. Hi Curtis, I have a question. I have the Rode NTG 3 connected to the Tascam DR-100 MKII, and with the "AUTO/LIMITER" disabled, the signal clip totally on -6db. Can you help me? Is your song available for purchase? Hey Curtis, can you review the new Tascam DR-100mkIII or make a comparison with same level devices ? Can the Tascam Dr100mk3 be used as a bus powered usb audio interface for ipadpro? Hi Curtis, thank you very much for your videos, I am not sure if you are aware, but you helped a lot of my friends and me, to become a better video makers. I love your channel. Thank you very much for everything. Your videos are SO HELPFUL! THANK YOU! Great video Curtis, thank you. As the Orange Guy might say, "So good. So good." Very well done. Knowing what to do in post really pays off in the end result. Thanks But watching your video in youtube is on stereo what you doo after. to make it stereo.